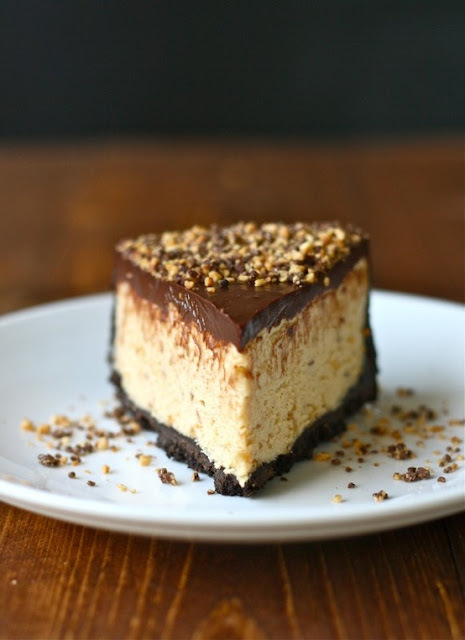 designer bags and dirty diapers: The Best Chocolate Peanut Butter Pie Ever! The Best Chocolate Peanut Butter Pie Ever! I really need a class in 101 food photography because this pie is way better than it looks in this picture. Why is it so hard to take pictures of food? I don't get it, even Instagram didn't make it look better. You have to just trust me when I say this pie is incredible. I made it for Thanksgiving dessert and it was a huge hit. Peanut Butter desserts are my all time favorite. I could eat them every day. This is one of the best peanut butter pie's I have ever had - if you live in Charleston it rivals the one at 5 Loaves which is awesome. The chocolate and creamy peanut butter filling go together so well. Pure decadence I tell you. Serve with whipped cream and you are in business for a fantastic dessert for any company! MAKE THE CHOCOLATE CRUST: Preheat the oven to 375°. Melt butter and stir into the cookie crumbs. Press the cookie crumbs over the bottom of a 9-inch springform pan and 1 1/2 inches up the side. Bake the crust for 10 minutes, or until set; the crust will continue to firm up as it cools. MEANWHILE, MAKE THE PEANUT BUTTER FILLING: In a large bowl, using a handheld electric mixer, beat the cream cheese with the peanut butter, sugar and vanilla extract until blended. In another large bowl, using the same beaters, whip the chilled cream until firm. Fold one-third of the whipped cream into the peanut butter mixture to loosen it, then fold in the remaining whipped cream. Spoon the filling into the crust, smoothing the surface. Sprinkle lightly with salt and refrigerate until set, about 3 hours. MAKE THE CHOCOLATE TOPPING: Place chopped chocolate in a medium bowl. Heat cream over medium heat until simmering. Add cream to chocolate and stir until melted. Spread the chocolate topping over the peanut butter filling and refrigerate until just firm, about 15 minutes. Sprinkle the chopped peanuts and chocolate around the edge of the pie. Carefully run a thin knife around the pie crust to loosen it, then remove the springform ring. Using a sharp knife, cut the pie into wedges. Run the knife under hot water and dry it between each cut. God you make me look like the biggest slacker ever!! This looks to die for. Yummmmm!! Oh my gosh my mouth is watering, chocolate and peanut butter are my favorite combination. That looks amazing. Mr. BMJ could probably eat that in one sitting. I'm going to save it and whip one up for Valentine's Day! call me crazy but I just learned to like peanut butter and chocolate combo this year. And now I'm obsessed. I think I'll make this to bring to Christmas with Matt's family! That pie looks amazing. On another note, and I hope you read your comments, where did you get those white plates in your photo. Just decided I want white plates and I love those!!! Please share. Oh my gosh. That looks incredible. I think you just need more natural light. Are you taking the pictures at night? Or make sure you're right by a window? Looks awesome. The second photo was most likely taken with a dslr camera. I invested in a Canon Rebel and could not believe how the quality of my pictures changed!! This recipe looks amazing. Will have to try! This sounds insane! One of my favorite flavor combos, can't wait to try this! Geez Louise that pie looks amazing. Chocolate and peanut butter combo is my weakness. peanut butter and chocolate are my favs! I need to make this! You are amazing and this pie looks to die for. I take all my food pics during the day with natural light always near a window with no over head light. I hope this helps. =)))) Happy Cooking. Make This Recipe + Scenes From Our Christmas! Weekend Happenings + Social Dress Shop Winner! !